The White House has acknowledged it recycled back-up tapes of e-mails sent over eight months of 2003, which may mean millions have been lost forever. 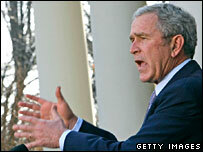 The taped-over e-mails could include messages discussing the Iraq war and leaking of a CIA officer's identity. The White House disclosure was forced by a lawsuit brought by private groups. White House spokesman Tony Fratto said there was "no basis to say that the White House has destroyed any evidence or engaged in any misconduct". If the e-mails were not saved, the White House may have violated laws which require the preservation of documents that make up part of presidential and federal records. 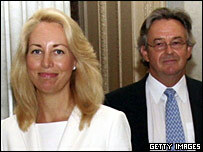 The possibility that some of the lost e-mails may have dealt with the leaking of the identity of CIA operative Valerie Plame in 2003 has fuelled interest in the case. The leak resulted in her resignation from the CIA and, three years later, the conviction of top White House aide Lewis "Scooter" Libby on charges of obstruction of justice and perjury. Citizens for Responsibility and Ethics in Washington (Crew), one of two groups bringing the lawsuit against the White House, says the problem stems from its decision to dismantle its electronic record-keeping system from March 2003 at the same time as recycling back-up tapes of deleted emails, a process which continued until the end of October 2003. Crew claims that up to 10 million e-mails may have been lost between 2003 and 2005. "The significance of this time period cannot be overstated: the US went to war with Iraq, top White House officials leaked the covert identity of Valerie Plame Wilson and the Justice Department opened a criminal investigation into their actions," Crew said in a statement. The group has questioned the White House's apparent failure to explain how the problem arose or to determine how many e-mails may have been permanently lost. In a sworn court statement, Theresa Payton, chief information officer for the White House Office of Administration, said the White House "does not know if any e-mails were not properly preserved in the archiving process". She said e-mails sent between October 2003 and 2005 should be contained on back-up tapes which had been preserved and stored. Previously they had been recycled in a manner "consistent with industry best practices". In December, Henry Waxman, Democratic chairman of the Oversight and Government Reform Committee of the House of Representatives, expressed concerns about the Bush White House's preservation of electronic records. After the second term of President George W Bush comes to an end in January 2009, the White House will be obliged to turn over all its presidential records to the National Archives.